I attended the February 2016 Rockworks 17 workshop held at the Table Mountain Inn. I brought up the following issues to the Rockworks support staff at the workshop, but no one could help me. I'm sending the data again in the hope that someone can help me figure this out. I have around 60 short sediment core logs that were taken over a very wide area. 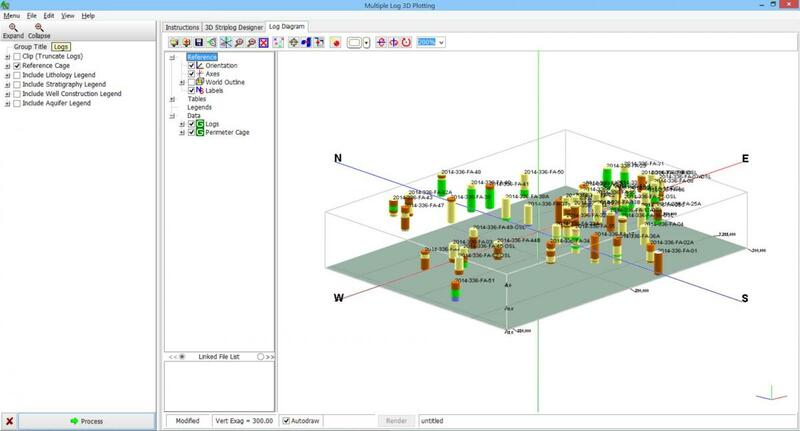 When I go to display the logs in any sort of 3D diagram I need to crank the V.E. up to around 300 just to visualize the figure. When I do this it places the bore hole labels well above the figure and out of site (unless you zoom very far out, which does me no good). How can I move the labels down so they are visible when displaying the boreholes at any scale? Also, even though I have the project dimensions to be read from the Logplot core logs, the maximum and center values don't make any sense. From the logs (originally Logplot .dat files) my maximum elevation is -3.35 meters and my minimum elevation is -15.25 meters, but when I plot a 3D diagram the default values for these boxes are a minimum of -15.61 meters (not too far off) and a maximum of 253.65 meters with a center elevation of 119.02 meters (both way off). I don't understand why these are the default values. Does anyone have an idea? I have attached several screen shots and data for you to mess around with at you leisure. Thank you very much in advance. From the screenshots it looks like you are using RockWorks15. If you need to apply that much vertical stretch, you should go into the 3D Striplog Designer tab, access the Titles settings, and set the Vertical Offset for the title text to "Manual" with a value of 0. Then there will not be any space between the top of the log and the title text, so the vertical stretch should not make the labels jump up so high. The same setting is available for 2D logs for stretched section diagrams. I imported your BH files into a new RockWorks15 project, assigned some lithology colors and scanned the project dimensions, and here are the 3D logs, stretched 300x.